Today’s Museum of the Day celebrates the art and architecture of the Milwaukee Art Museum with the exciting and moveable Quadracci Pavilion addition designed by Spanish architect Santiago Calatrava. The Milwaukee Art Museum is an architectural landmark, comprised of three buildings designed by three legendary architects: Eero Saarinen, David Kahler, and Santiago Calatrava. The museum collects and preserves art, presenting it to the community as a vital source of inspiration and education. In addition to the works in the Museum’s Collection galleries, there are a variety of changing exhibitions throughout the year, including the three major feature exhibitions in the Baker/Rowland Galleries of the Quadracci Pavilion. Add this to my bucket list! 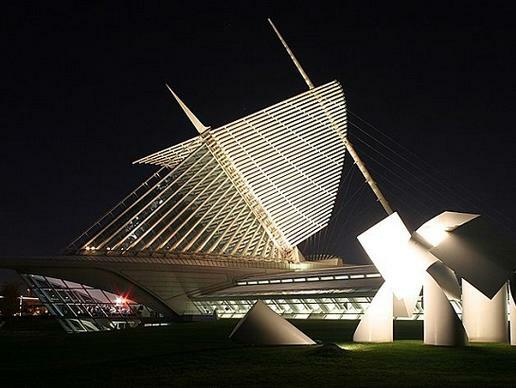 I am a big fan of Calatrava and would love to visit Milwaukee.